No doubt you’re seeing these riotous shrubs and small trees in bloom right now! These beauties like it hot, and are at their best in the warm months. Some plants grow tired and stressed when high temperatures persist day after day. Crape myrtles, on the other hand, thrive under these conditions, making them valuable flowering shrubs or small trees in the summer landscape. 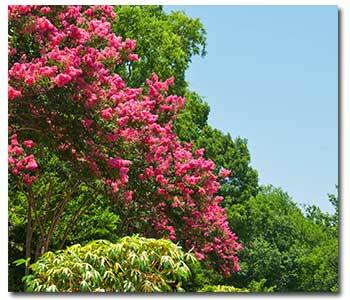 Whether trained as standard or multi-trunk trees, crape myrtles make beautiful specimen or accent plants. Showy crinkled flowers are abundant throughout summer, with colors ranging from the reds to pinks, purples, and white. Plant these lovely shrubs in any sunny spot where summer color is needed. Planting is best done in late spring or summer, when they are actively growing. For desired size and shape, prune in early spring. Don’t worry too much about your pruning skills, as they bloom on new wood. However, it is important to deadhead as blossoms fade in order to encourage continuous bloom. Crape myrtles are long-lived, drought tolerant (once established) and relatively pest free, although sometimes aphids and powdery mildew can be a problem. Watering in the morning, to give the foliage plenty of time to dry, will help keep mildew away. As if that weren’t enough, the handsome bark and fall leaf color add to an already stunning plant. Add one or more to your landscape, then just sit back and enjoy the show!